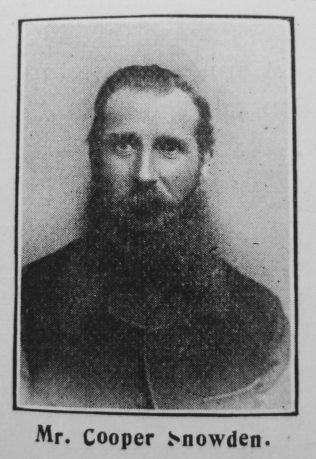 THE Grimsby 2nd Circuit has lost “a prince and a great man” by the decease of Mr. Snowden, which took place on April 15th, 1901. He was born at Winteringham, North Lincolnshire, August 1838, his days on earth thus falling a little short of 63 years. He had only such educational opportunities as the average village afforded more than half a century ago. His apprenticeship was served with Mr. J. Waddingham, builder, of West Halton, whose daughter became his wife and true helpmeet in 1862. In 1866 he removed to Grimsby, where he succeeded in establishing a large and prosperous business. The life now closed on earth possessed some strong and striking features and qualities. Intellectual.– Mental power far above the average was given to our friend. Early in life he formed habits of reading and study, and by dint of unremitting application and discipline he developed an intellectual capacity which has surprised his closest friends. It was manifest in his commercial achievements, in the part he has taken in the administration of elementary and secondary education in the town of his adoption, and, most of all, in the manner in which he read and mastered the best books on theology, Biblical criticism and exposition, and ecclesiastical history. His power to grapple with profoundly intellectual problems, and to retain and use the fruits of long and patient study, was a distinctly Divine endowment. With mystics like Jacob Behmen, William Law, and John Pulsford, he held daily communion. For many years he took a stiff course of reading every morning before breakfast. We have not met with a layman, and with few ministers, whose reading was more wide and thorough, and whose library was so choice and replete as Mr. Snowden’s. Public.– Naturally of a quiet and retiring disposition, yet our brother filled a large place in the public life of both the town and the Church. He was one of the most zealous and indefatigable members of the Grimsby School Board from its formation in 1874, with a slight interval, until his decease, and in addition served our own day school as Treasurer and Secretary for many years. Although a thoroughly enlightened Liberal politician, he took no prominent part in political warfare. In the Church he filled a large place. He more than once represented his circuit in District Meeting, and his district in the Conference. He designed and built many of the most comfortable and commodious chapels in north Lincolnshire. He was a trustee of nearly all the chapels in his own circuit, and of many beyond its limits. For many years he acted as class leader in connection ,with our Bethel Church, with which he was associated during the whole term of his residence in Grimsby. Summer and winter his services as a local preacher were at the disposal of our churches in town and country for over 40 years, and he had a special delight in village work. Spiritual.- Mr. Snowden commenced life with the incomparable advantage of having a godly mother. At the age of 17 years he was converted to God, and joined the Church, in whose fellowship he lived and laboured to great purpose, and fell asleep in perfect peace. His profession of Christ was marked by sincerity, earnestness, and humility, rather than by loudness and demonstration. As an employer of labour he was just, considerate, and humane, and his employees deeply mourn his decease. His religion had a sweet domesticity about it, and he showed “piety at home.” The prevailing note in his character was his concern for reality. Forms, names, theories went for nothing, but genuineness, integrity, a saving hold of Jesus by faith, being well upon the Rock – these were the supreme concerns of his life. Superficiality in intellect, profession, or life he utterly condemned. Jerry-building was as obnoxious to him in religion as in business. “I am trusting in Jesus.” “The anchor holds,” “ It is a good thing to pray” were among the last words we were permitted to hear out of lips from which so much truth and wisdom have emanated. Cooper’s parents were Robert and Maria. The 1851 census describes Robert as a farmer of 20 acres. Census returns identify the following occupations for Cooper. Cooper married Mary Jane Waddingham (1837-1913) in late 1862 in the Glanford Brigg Registration District, Lincolnshire, probably at West Halton where she was born. Census returns identify ten children. Cooper’s probate record records that his estate was valued in excess of £21,000.